In the annals of the Red Sox/Yankees rivalry, there aren’t too many players who started with New York, then played for Boston, and then played for New York again. Frank LaPorte wasn’t the only one, but he was the first. He was a stocky man, 5-feet-8 and weighing 175 pounds. LaPorte played second base, third base, and the outfield, batting and throwing right-handed. After bouncing back and forth between the two teams, he also played for the St. Louis Browns and the Washington Nationals, spending nine years in the American League before jumping to the Federal League and then leaving baseball. LaPorte was born on February 6, 1880, in Urichsville, Ohio, somewhat in the center of a triangle between Columbus, Akron, and Pittsburgh. That’s where he was raised and went to school. His father, George, was a furniture dealer and by the time Frank was 20, all three of George’s sons worked in the business as well. Esther LaPorte also gave birth to a daughter, and the family was well-enough situated financially that they had a servant, Lillie Lovejoy. Ten years later, the “servant” was listed in the census as a “house keeper.” Strictly speaking, the LaPortes lived in Mill Township, Ohio. LaPorte apparently played semipro baseball for some years. Pittsburgh Gazette-Times editor Jim Jerpe recalled years later that LaPorte had played as early as 1896 for the Irwin (Pennnyslvania) Independents, as a catcher. In 1903 he began to seriously play professional baseball, in the first of three seasons for the Buffalo Bisons (in the Class A Eastern League) under manager George Stallings, who ranked him high, telling Sporting Life that he was going to be a “great player.”  In the September 23, 1905, issue of Sporting Life, Stallings – who by then had managed LaPorte for three seasons – said that he saw him as second only to Napoleon Lajoie. LaPorte was a catcher at first, though he wound up working more at second base. He hit .240 in his first season with Buffalo, missing much of the end of the year with a sprained ankle. After the season his contract was purchased by the Detroit Tigers, but he remained in Buffalo for two more seasons. LaPorte hit well in 1904 (.282 with a league-leading nine home runs) and 1905 (a league-leading .331, with eight homers). The Bisons won the Eastern League pennant in 1904. After the Eastern League season ended in 1905, LaPorte was drafted by the New York Highlanders (as the Yankees were called at the time), beating out the Washington club, which had been negotiating with Buffalo and then let talks lapse. Clark Griffith’s New York club snagged LaPorte through the draft, and why Jake Stahl’s Washington Nationals hadn’t drafted him was a question raised at the time. 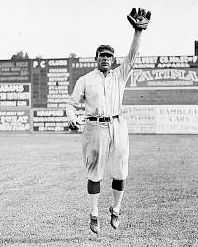 New York bought his contract outright, and he made his debut on September 29, 1905, against visiting Cleveland. The New York Times said he “made a decidedly good impression at second base for the local team. The little fielding that he had to do was done in a clean manner, while at the bat he hit with tremendous force. He had three trials, and in each instance was put out by sensational catches.”  He was a .400 hitter in his first season – over the course of 40 at-bats – with one home run and a productive 12 runs batted in in 11 games. LaPorte played full seasons for New York in 1906, primarily at third base (.264 with 54 RBIs), and in 1907 hit .270 with 48 runs batted in, evenly split between third base and all three positions in the outfield. With one game at first base, he’d played every position but pitcher and catcher. On October 12, 1907, a two-stage trade sent Boston’s Freddy Parent to the White Sox for Jake Stahl and then sent Stahl to New York for LaPorte. On the eve of 1908 spring training, Red Sox manager Jim McGuire (they’d been officially named the Red Sox in December 1907) said he “thinks he will have a fast team and that LaPorte … will be a star at the new bag [second base], his regular position.”  He fell short of stardom, batting .237 in 62 games with 15 RBIs, until August 17 when he was traded back to New York, straight up, for infielder-outfielder Harry Niles. (Some accounts say Boston owner John I. Taylor took some cash in the deal as well.) Manager McGuire resigned a couple of weeks later, but denied that it had anything to do with the trade, saying that Niles could play both infield and outfield at a higher level than LaPorte. Amby McConnell was playing well for Boston, so LaPorte had become a utility player. Niles had been disappointing in New York and Yankees owner Frank Farrell wanted to bring LaPorte back. He matched the 15 runs batted in 39 games for New York, batting .262. One of several contenders for infield positions with the Yankees in 1909, LaPorte came on stronger than expected in spring training (“has worked himself into first-class condition,” wrote the April 4 New York Times) and made the team. The new manager of the team was Frank’s old manager from Buffalo, George Stallings, who had been New York’s skipper in 1909 and 1910. LaPorte appeared in 89 games and batted .298, not playing more frequently due in part to nagging injuries suffered in early August. Other teams were after LaPorte before the 1910 season, including Jack Dunn’s Baltimore Orioles, but Stallings didn’t want to let him go. LaPorte hit .264 in 124 games for New York, driving in 67 runs – the most RBIs he’d had in his career to date. And Sporting Life’s assessment was “LaPorte was too uneven a player to give great satisfaction to the patrons of the Hilltop [the Yankees’ ballpark]. The smallest thing, too, seemed to put him out of the game. Stallings, who was LaPorte’s best friend, admitted that the Frenchman was not game, that he was willing to quit for the slightest accident.” The Browns wanted him mainly for his hitting. The year 1911 was the first time in LaPorte’s career that he had the opportunity to play consistently at his preferred position, second base. He appeared in 136 games, 133 of them at second, and he hit .314 (almost 50 points higher than anyone else on the team) and drove in 82 runs, 20 more than any other Brown. The team itself fared poorly (45-107, in last place in the American League and 56½ games out of first place. Clark Griffith was now the manager in Washington and sought LaPorte, whom he knew from when he was managing in New York. He acquired him as a utility player, however, not to use him as a regular. “It is not intended to play LaPorte regularly unless someone is hurt,” stated Washington Post columnist Joe S. Jackson the morning after the trade. As it turned out, work was found and LaPorte got into 40 more games, hitting .309. While with the Senators, he was one of several players who saved many men and women during a hotel fire in Detroit on September 15. It was a disappointing year for LaPorte in 1913; he appeared in just 79 games and batted only .252, but the Senators’ starting infielders each played fairly full seasons and Griffith wasn’t about to mess with matters, given that the team was in the pennant hunt all year long, finishing second – though LaPorte’s bat might have helped give them a boost in the middle months when things weren’t looking quite as good. About a week before the end of the season – on September 27 – Griffith sold LaPorte’s contract to the Kansas City Blues of the American Association. The amount of the transaction was not made public. Kansas City didn’t benefit from the acquisition, since LaPorte jumped his contract and agreed in mid-March to play for the Federal League team in Indianapolis, the Hoosiers. It was a year when everything came together nicely. His team won the pennant under manager Bill Phillips, who had made Frank team captain, and he won the league RBI title, driving in 107 runs. He hit for a .311 average. There was no World Series for the Federal League, however. And the “Hoofeds” weren’t home for LaPorte in 1915. He played for the Federal League’s Newark Pepper in ’15, appearing in a career-high 148 games, but hitting only .253 with 56 RBIs. After the season LaPorte was turned over to the Brooklyn Tip-Tops to complete a deal that had been struck in August. The League, however, folded. LaPorte was kept on the reserve list of Kansas City and Washington, as much as anything to prevent him from being a free agent after jumping his contract to go to the Feds. But he was 35. Perhaps it was time to do something else. One thing he did is get married, in January 1917, to Corinne “Bess” Laub. There may have been an earlier marriage to a Coy Wight, date unknown. Frank and Bess settled in Mill Township and he is listed as a farmer both at the time of his World War draft registration and in the 1920 Census. LaPorte later took up as foreman of the Heller Tool Company in Newcomerstown, Ohio, which specialized in making files. Bess found work at the same file plant as a stenographer. Newcomerstown was where LaPorte died of heart failure on September 25, 1939. In addition to the sources noted in this biography, the author also accessed LaPorte’s player file from the National Baseball Hall of Fame, the online SABR Encyclopedia, the Encyclopedia of Minor League Baseball, Retrosheet.org, and Baseball-Reference.com. Sporting Life, May 2, 1903. A later issue of Sporting Life (October 31, 1914) said that LaPorte had first signed with the Birmingham Barons but that his parents had made him quit that club, after which he signed with Buffalo. Sporting Life, February 25, 1911. LaPorte did speak French. Correspondence found in LaPorte player files at the National Baseball Hall of Fame.